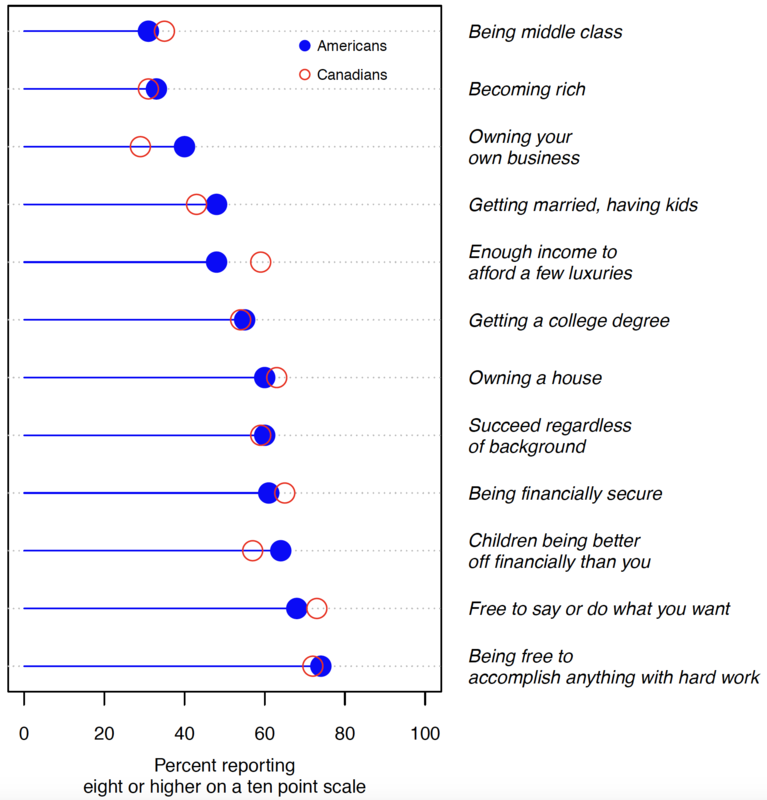 The Pew Charitable Trusts conducted a number of public opinion polls asking Americans what meaning they attach to the phrase “The American Dream,” and these have been adapted and conducted in Canada with remarkably similar responses. In these polls respondents were asked to indicate the degree to which they agreed with a series of possible definitions of the American Dream. 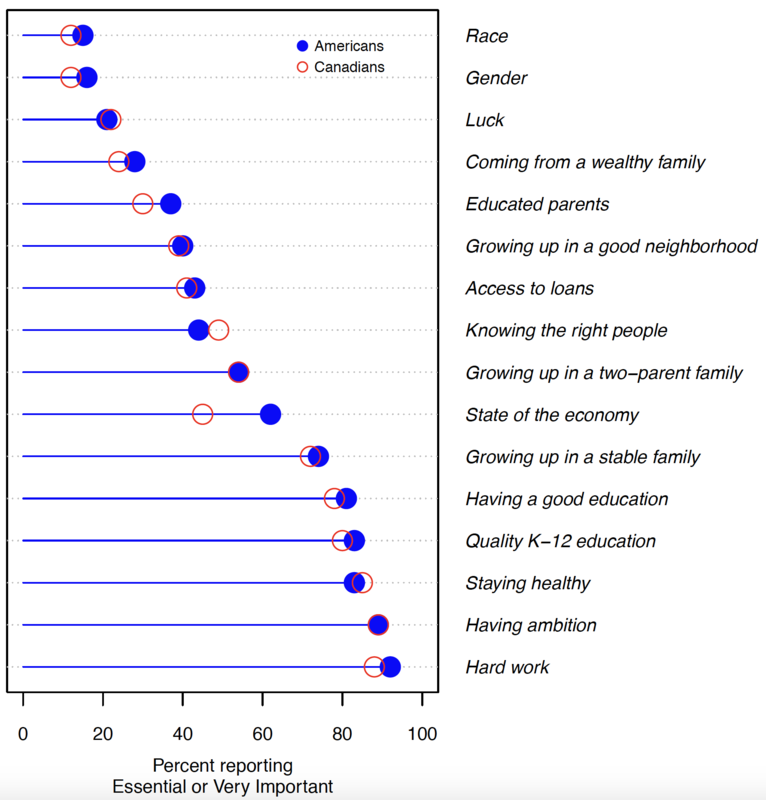 Sixty percent of American respondents ranked “being able to succeed regardless of family background” eight or higher on a ten point scale, while 59 percent of Canadians did so. 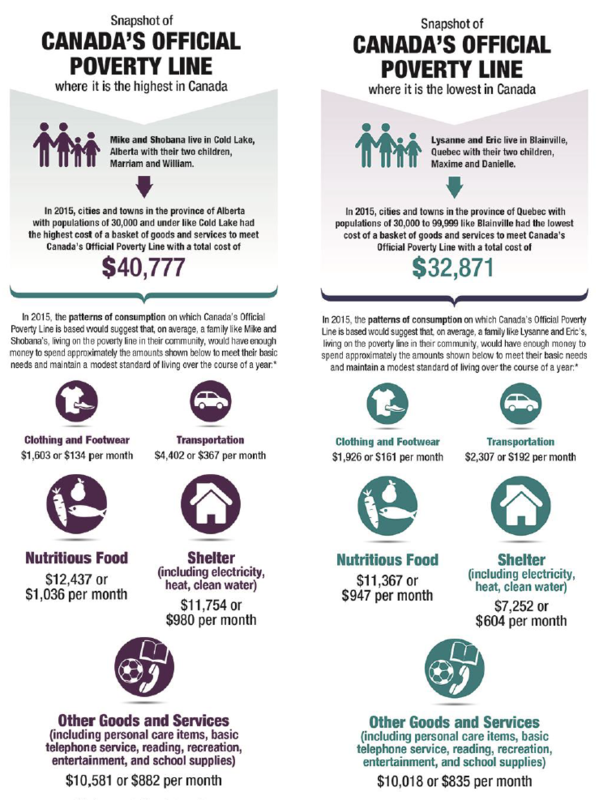 The percentage indicating that the statement “Your children being financially better off financially than you” represents the American Dream was 64 percent in the United States, and 57 percent in Canada. These two options relate most directly to social mobility as measured by social scientists, and the country differences in responses to them are not statistically significant. In fact, this was the case for the ratings given to all but one of the other ten options presented to these representative samples, Americans ranking “Owning your own business” more highly. Source: Connolly, Corak, Haeck (2019) using data from Corak (2010). Americans and Canadians also have similar views on the factors determining upward mobility, whether these deal with causes beyond an individual’s choice or responsibility—like race, gender, and luck—or to others under a person’s control. In both countries, factors associated with individual choice are viewed as the prime drivers of economic mobility. On the other hand, small minorities in both countries cited race, gender, or luck as being essential or very important, “luck” being the most cited with 21 percent of Americans and 22 percent of Canadians thinking of it in these terms. Indeed, the responses along a whole host of possible causes are very similar, if not identical. But if Americans and Canadians hold a similar meaning of the good life, and similar views on how to obtain it, they have significantly different views on the role of collective action through public policy. Other surveys show that while 35 percent of Americans “strongly agree” or “agree” with the statement “Government’s responsibility is to reduce the gap between high and low incomes,” a significantly larger proportion (47 percent) of Canadians have this view. This said, attitudes in these two countries are much more similar than in European countries, where the majority and often the strong majority feel redistribution is an important government responsibility. The Pew-based research also suggests that Americans and Canadians share a preference for equality of opportunities over equality of outcomes: 71 percent of Americans and 68 percent of Canadians feel it was more important “to ensure everyone has a fair chance of improving their economic standing” than “to reduce inequality.” But the biggest difference in attitudes between citizens of these countries is that Canadians are much more likely to offer a more “activist” role for their governments. 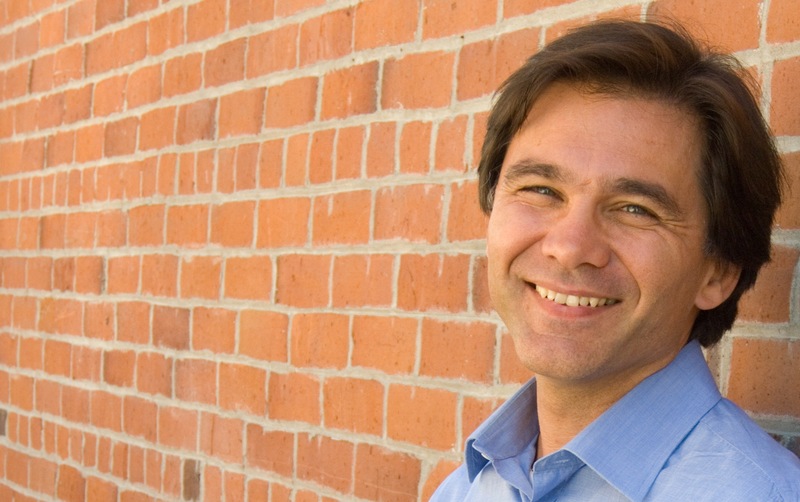 Cross-country differences in social mobility may be the result of a whole host of factors associated with public policies, and also with labor market inequality, and the structure and strength of families, but they also may simply reflect different social choices reflecting different values among the electorate. Since Canadians and Americans seem to define and value mobility in the same way, comparing them may help place a sharper focus on things that can be changed. In other words, a Canada-US comparison might open up a wider menu of choices in American public debate than if the comparison was just over time within the country, or for that matter to European countries, which can be more easily dismissed as not relevant to American values.